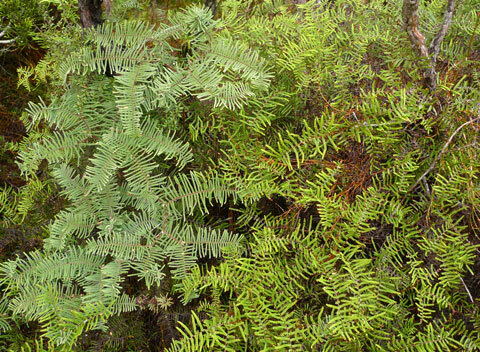 I’d like to introduce a new species of New Zealand fern, Gleichenia inclusisora. Our scientific description was published just before Christmas 2012. The recognition of this species edges the number of native New Zealand fern and lycophyte species nearly to 200. Abstract of paper describing Gleichenia inclusisora. Email me if you would like a pdf of the paper. Te Papa’s list of New Zealand ferns and lycophytes. The specific part of the name, inclusisora, refers to the reproductive structures (the sori) being embedded (included) in a pit within the frond. 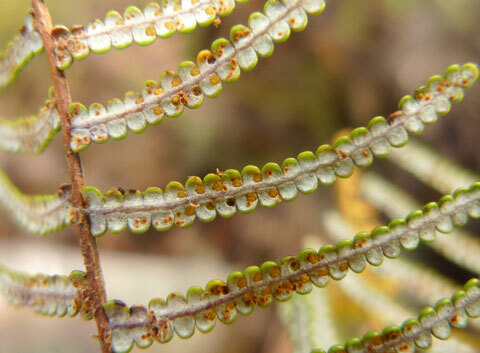 In other New Zealand Gleichenia species, the reproductive structures sit on the surface of the frond undersides. Close-up of the frond underside of Gleichenia inclusisora. 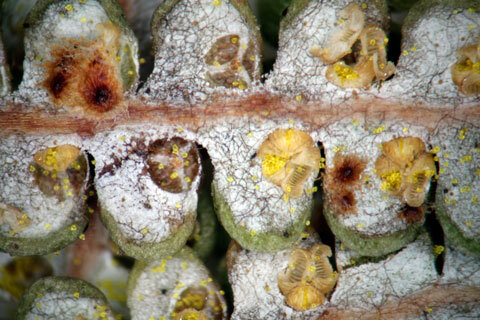 The reproductive structures (sori) each comprise three sporangia (which produce the spores, the yellow dots) embedded in a pit in the frond. Some empty pits are visible. The distinctive rounded, bicoloured scales can also be seen at top left. Photo Leon Perrie. © Te Papa. Blog post with an image close-up of the distinctive scales of Gleichenia inclusisora. 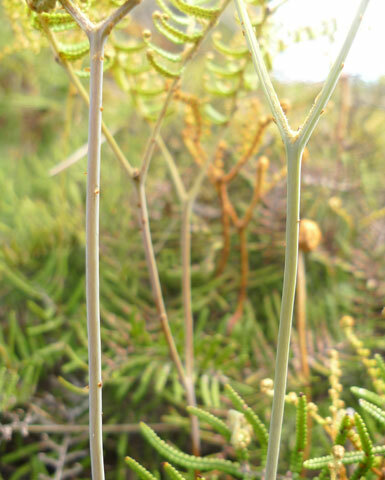 Except when very young, the lower stems of Gleichenia inclusisora are nearly naked of scales or hairs, in contrast to the other Gleichenia species in New Zealand. Photo Leon Perrie. © Te Papa. All four Gleichenia species presently recognised in New Zealand can grow together, to the extent of intertwining. Gleichenia inclusisora most commonly co-occurs with Gleichenia dicarpa. Gleichenia inclusisora (right) often has a shinier upper surface, usually allowing the two species to be distinguished at a distance. However, this doesn’t always work as well as it does in this photo! Photo Leon Perrie. © Te Papa. Tangle fern is the common name in New Zealand for Gleichenia ferns, and they are so-called because their long, repeatedly-dividing stems grow tangled with one another and other plants. The new species has a number of features that easily distinguish it from the other Gleichenia species in New Zealand. So why has it not being recognised until now? Well, like their growth-form, their taxonomy (classification and naming) is also tangled, being confusing and neglected. The recognition of Gleichenia inclusisora is easy enough, but more study of the other New Zealand Gleichenia is required, particularly the separation between what we currently call Gleichenia dicarpa and Gleichenia microphylla, as well as on the diversity evident within Gleichenia dicarpa. Blog post on how Gleichenia inclusisora was first discovered. We suggested Gleichenia inclusisora have a conservation ranking of Naturally Uncommon. It has a scattered distribution, with living populations known from Coromandel and along the South Island’s West Coast. . You’re most likely to encounter it in the Westport-Greymouth area, where populations can be locally extensive. Distribution map of Gleichenia inclusisora based on Te Papa’s collections. But please look out for this distinctive species elsewhere; it is quite possible that populations remain to be discovered. Leave a comment below, or email me. Our description of Gleichenia inclusisora is part of an intensive revisionary effort as we write an eFlora for New Zealand’s ferns and lycophytes. This will comprise a detailed digital guide to these plants. Work in progress will see the number of native ferns and lycophytes recognised in New Zealand top 200 within the next few years; we already know of several more new or otherwise currently unrecognised species. Working at a property in Coatesville, Auckland and found quite extensive ground cover of Gleichenia inclusisora. That’s a significant range extension. Are you able to document this publicly, either with photos uploaded to NatureWatchNZ (or emailed to me: leonp@tepapa.govt.nz), or, preferably, with a specimen lodged with a public herbarium (e.g., Te Papa, Auckland Museum)? New Eelpout Species Discovered Off New Zealand Coast (PHOTOS) « Habari Gani, America!